ca 40 cm heigh bronze plated Baphomet statue. This figurine is cast in the highest quality resin before being carefully bronze plated. 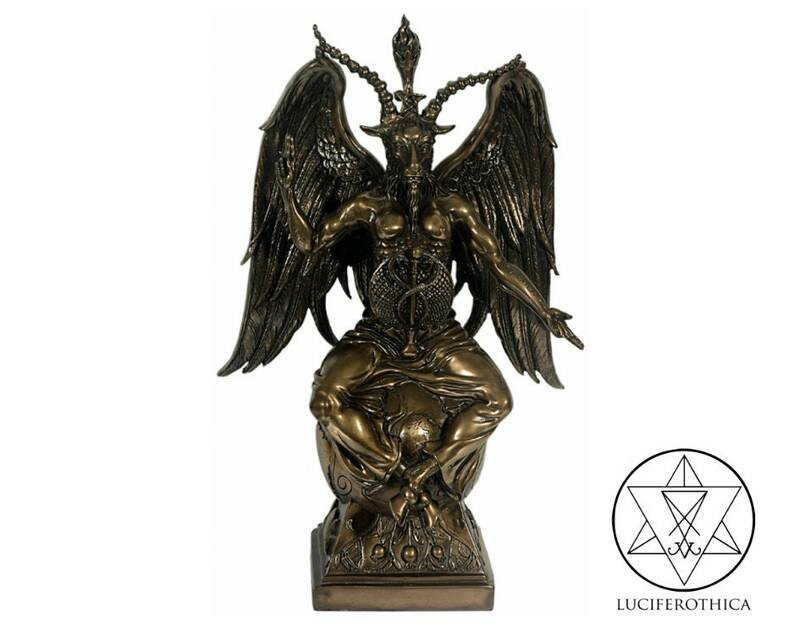 Heighest Altar Baphomet statue available. The weight of the package is 3,1 Kg. Shipping costs are calculated on the total weight. The globe of the earth acts as Baphomet’s seat. Sitting cross-legged on top of the world, Baphomet sits, symbolizing the sum total of the universe. Legs ending in cloven hooves, the staff of Asclepius rises from their crotch. Their right arm is raised in a magical blessing with the word SOLVE written on their forearm, while their left arm is stretched downwards and outwards invitingly, forearm bearing the word COAGULA. Their triple-horned goat’s head stares directly forwards as their wings stretch out behind them. Worshipped by occultists from Jacques de Molay’s Templars to Alistair Crowley, Baphomet has long been a symbol of free-thinking heresy and forbidden knowledge.